Although it was Father’s Day (June 21st) it did not seem to mean much to Anne Lambert (4 wins) and Mary Schmidt (3 wins) who shut out the guys in all 7 of the races held. Gary Schmidt was able to finish with a couple of seconds and thirds but other than that–Lady’s RULED on Father’s Day!!! As you might suspect–There were plenty of excuses –AND– a GREAT deal of boat swapping as the challenged tried to get back on the FAST TRACK!! To ensure integrity of scoring we called out names rather than numbers as boats crossed the finish line! The string and Shifty Wind-also shifted the Standings. I believe that the guys could have done much better if there were not so many baby ducks on the course. They were, of course, trying to be protective of them and it was Father’s Day. We have one more Sunday in June to race which will take us to the midpoint of our Summer Series. Our intent is to take the 4th of July weekend off then resume each Sunday after (4-6pm south dock) in July to complete the series. 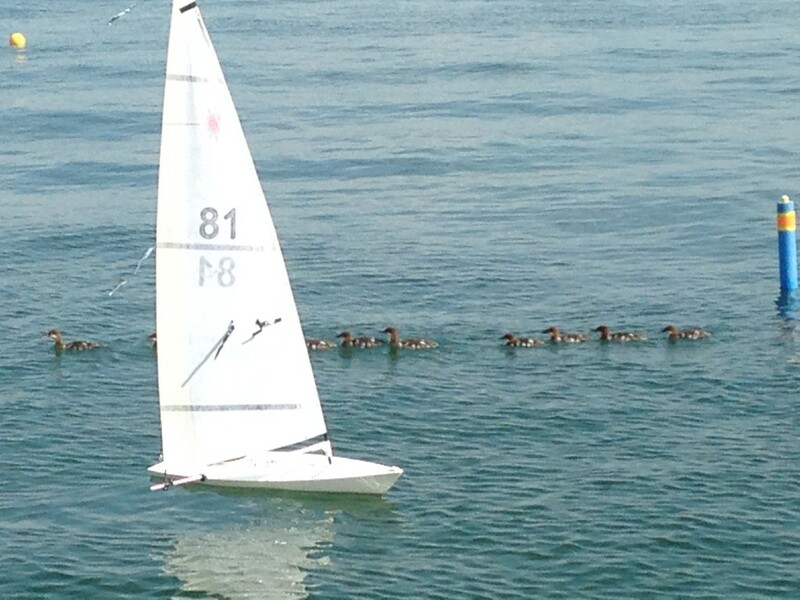 Jay Niggli at the starting line with all his ducks in a row.